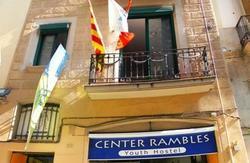 We offer to our guest high quality facilities, pre-organized activities, and a nice, relaxed and international atmosphere. 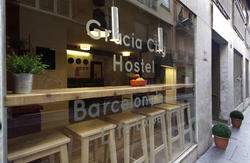 The hostel is located in the centric and bohemian Gracia Quarter, one of the trendiest quarters of the city. Once there, you will find nice plazas with terraza bars, cafes, cool and trendy people, and some of the most fashionable bars in town, and all kind of cuisine restaurants; art galleries, theater and exclusive stores. Gracia is a great spot to discover in the Mediterranean! 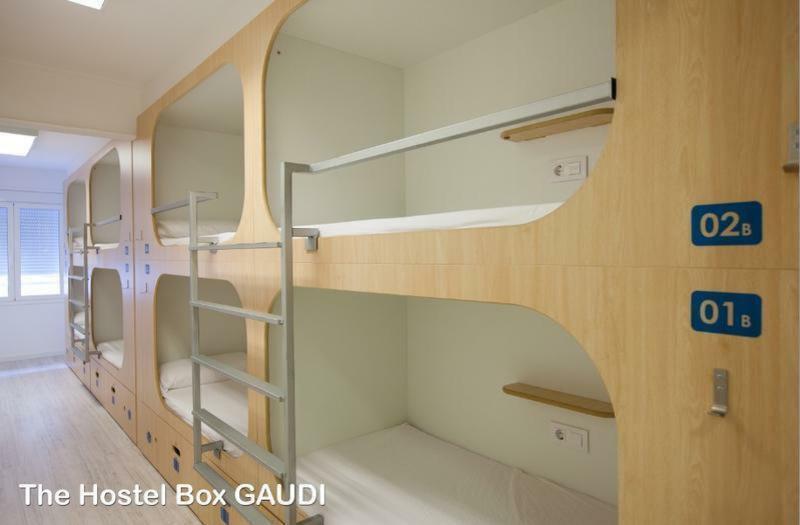 The Hostel Box priority is our clients comfort. We have designed our beds under the Box concept, providing privacy, design and comfort to our clients. 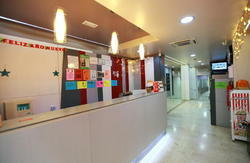 In the common areas, our clients will be able to satisfy all their needs. Visit us, and enjoy a great experience. 4.Once out at the street, walk down Avinguda de Vallcarca, and turn left on the fourth street you will find, Baixada de la Gloria, and then turn right towards Mare de Deu de Coll. Keep walking 60 meters, and 'The Hostel Box Gaud' is placed on the number 59. 1.If you arrive at Terminal 2 - B take the train to Barcelona Sants Estaci (20 min). If you arrive at Terminal 1, you must take a free suttle to Terminal 2. 4.Once out at the street, walk down Avinguda de Vallcarca, and turn left on the fourth street you will find, Baixada de la Gloria, and then turn right towards Mare de Deu de Coll. Keep walking 60 meters, and 'The Hostel Box Gaudi' is placed on the number 59. 1.Once you exit the terminal, take a bus to Barcelona Estacio del Nord (1 hour). 2.Go to the Tube station (Arc de Triomf) that is just in front of the Bus station, and take the Tube L1 (red line) to Hospital de Bellvitge. 5.Once out at the street, walk down Avinguda de Vallcarca, and turn left on the fourth street you will find, Baixada de la Gloria, and then turn right towards Mare de Deu de Coll. Keep walking 60 meters, and The Hostel Box Gaudi is placed on the number 59. 1.At the terminal front door, take the Hispano Igualadina bus to Barcelona 'Sants Estacio' You can get the tickets inside the Arrivals terminal. 4.Once out at the street, walk down Avinguda de Vallcarca, and turn left on the fourth street you will find, Baixada de la Gloria, and then turn right towards Mare de Deu de Coll. Keep walking 60 meters, and The Hostel Box Gaudi is placed on the number 59. 1.Go to the Tube station (Arc de Triomf) that is just in front of the Bus station, and take the Tube L1 (red line) to Hospital de Bellvitge. 3.Once out at the street, walk down Avinguda de Vallcarca, and turn left on the fourth street you will find, Baixada de la Gloria, and then turn right towards Mare de Deu de Coll. Keep walking 60 meters, and The Hostel Box Gaudi is placed on the number 59. 1.Take the Tube L4 (Yellow line) at the Barceloneta to Trinitat Nova.